America’s wealthiest households are stashing their cash at record levels. 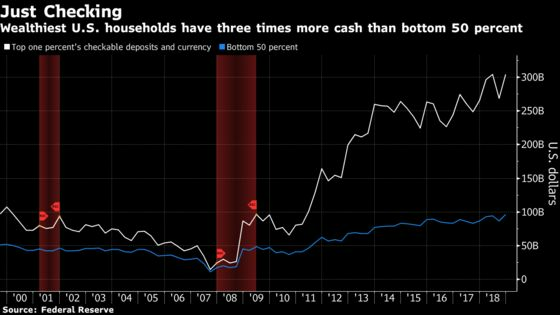 The top one percent have three times more in readily available cash than the bottom half, with holdings jumping from less than $15 billion shortly before the last recession to a record $303.9 billion at the end of 2018, according to Federal Reserve data released last week. By contrast, while holdings for the bottom 50 percent of households surged almost ten-fold since the pre-recession low, they’ve increased at a much slower pace than the wealthiest cohort.